December marked the 25th anniversary of the draw being made for the qualifying stages of the 1994 World Cup. The campaign would become infamous as England, semi-finalists at Italia ’90, failed to make it to the USA and Graham Taylor’s managerial reign ended in ignominious fashion. The weekend of December 7-8, 1991, was certainly one for draws being made. On the Saturday lunchtime, Saint & Greavsie viewers saw a certain Donald Trump help make the Rumbelows Cup quarter-final draw. That night, Match of the Day broadcast the FA Cup third round draw – with title protagonists Leeds United and Manchester United paired together for the second time in a day. And the following day the 1994 World Cup qualifying groups were decided. Few could have envisaged just what a calamitous campaign lay ahead for England. For the first time England were placed in a group of six sides, European football having welcomed an influx of new countries following the break-up of the Soviet Union. But England would not meet any of them, and apart from minnows San Marino – entering only their second major qualifying tournament – there was little in the way of originality. The Dutch, who seemed set to provide the sternest test, had met the English at both Euro ’88 and Italia ’90 (and it was a distinct possibility they could also face each other at Euro ’92). Poland were in England’s group for the third qualifying tournament in succession, while Turkey had been paired with the English in three other campaigns in the past decade. You had to go a bit further back for the last clashes with Norway, England infamously losing to them during qualifying for the 1982 World Cup. If the draw lacked in novelty for England fans, then at least on paper it looked like the side had a strong chance of progressing. The Three Lions only had to finish second to qualify, having always finished at least that high in every previous qualifying group even when they failed to make it. The Dutch were an obvious threat, but no other side in the group had qualified for a major tournament since Poland reached the 1986 World Cup. But as with the Poles 20 years earlier and Denmark a decade before, England had landed a joker in the pack who were about to represent their undoing. Norway had beaten Italy in Euro ’92 qualifying and they would pose a serious threat to the established order. 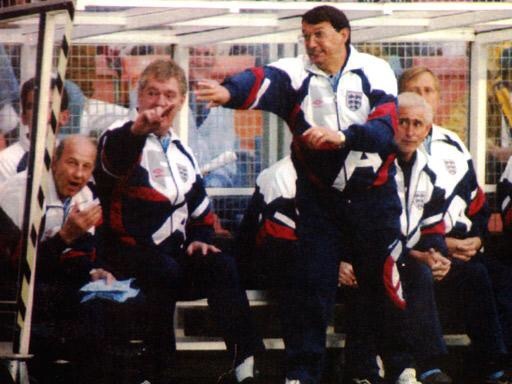 The pressure was increasing on Graham Taylor after Euro ’92. 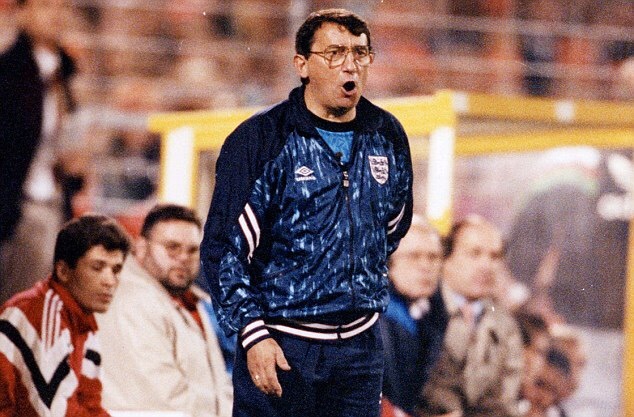 At the time the draw was made, Graham Taylor was enjoying a decent reign as England boss having lost just once since taking over in the summer of 1990 and qualified for Euro ’92. But then came the turning point of the European Championship in Sweden, a negative England crashing out in the group stages as the ‘Turnip’ taunt began against the boss. He had seemed tetchy when dealing with the media during the competition and now faced a tough challenge to win over the doubters, not helped by his controversial decision to sub Gary Lineker in defeat by the Swedes. It was the forward’s last act for his country before retiring, as Taylor now sought both a new captain and star striker. Alan Shearer – fresh from a big-money move from Southampton to Blackburn Rovers – would be the ideal man to fill the latter role, while Stuart Pearce became captain. But injuries would deprive Taylor of both men for part of the campaign, midfielder David Platt taking the captain’s armband and often being the main goal threat. One man back in the picture was Paul Gascoigne, returning to action after more than a year out injured and now playing in Italy for Lazio. By the time England next took to the field in September 1992, the new Premier League was under way. Paul Ince was handed his debut as he began his lengthy England career in a 1-0 defeat. But it was Taylor’s last chance to experiment for the qualifiers. The expansion of the qualifying programme meant competitive football would dominate the agenda in the coming months, starting with a home qualifier against Norway in October. In an era before the international calendar as we know it now, Norway had already played three qualifiers and won them all – laying down a marker by thrashing San Marino 10-0 and beating the Netherlands 2-1. They were not to be underestimated. Paul Gascoigne returned for England against Norway in October 1992. The build-up was overshadowed by Gascoigne’s ill-judged jokey response when asked by a TV interviewer to say hello to Norway. As the words “f*** off Norway” left his lips they were clearly going to create headlines, assistant boss Lawrie McMenemy trying to limit the damage as he reprimanded the player for his actions. For Taylor it was imperative England got off to a good start and they looked set to do just that when Shearer gave them a second half lead. But as England looked set to see the game out, they were undone by a long-range equaliser from Kjetil Rekdal. It ended 1-1, representing a point dropped by England (UEFA were still applying the two points for a win system) on a night when they had created more chances than the visitors. “Sometimes you don’t get what you deserve from life and this was one of those nights,” reflected Taylor, who remained confident of qualification. Five weeks later, Taylor expressed his wish for England to give him an early Christmas present by delivering at home to the Turks. Although Turkey had been thrashed by England three times during the 1980s, they had looked much-improved in two narrow defeats during Euro ’92 qualifying. The old order was to be re-established here, the impressive Gascoigne scoring twice in a 4-0 win as England ended a difficult year in better spirits. The resurgence of Gazza was a pleasing sight, but Taylor issued some words of caution: “Gascoigne is not fully fit yet. He knows that himself and the difference could be as much as another two goals out of him.” Rarely did Gascoigne seem as happy or loved under Taylor as he did during the reigns of Bobby Robson or Terry Venables. John Barnes was abused by a section of the Wembley crowd during England’s win over San Marino. In February England hosted the whipping boys of San Marino, amid the sad news about the legendary Bobby Moore being seriously ill with cancer. He was at Wembley to co-commentate for radio, just a week before he would lose his fight for life. It was not a glorious match for Moore to say farewell to the Twin Towers, England only holding a 2-0 lead until midway through the second half. The floodgates then finally opened, England eventually winning 6-0 with Platt scoring four of them. There would also be a solitary international goal for Carlton Palmer (memorably met with Taylor asking “what was he doing in the f***ing box?”) and a debut strike for Les Ferdinand. 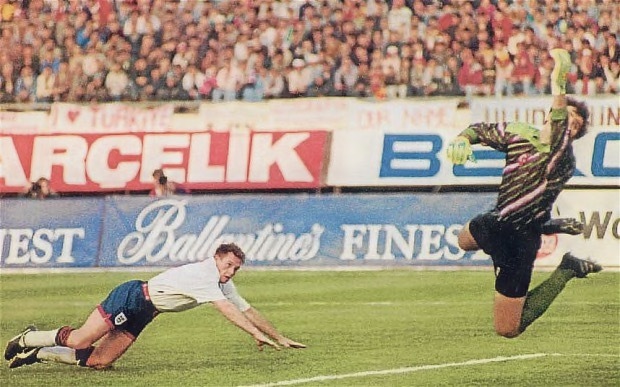 Paul Gascoigne scores for England in their win in Turkey. Next up was England’s trip to Turkey the following month, goals from Platt and Gascoigne providing a 2-0 win in a hostile atmosphere in which the players were struck by coins. Taylor’s side had seven points from eight and all looked positive going into the huge game at home to the Netherlands in late April. Barnes enjoyed a far more positive response from the Wembley crowd than a few weeks earlier and within two minutes had scored a delightful free-kick to break the deadlock. When Platt doubled the lead midway through the half all seemed good in the world, England giving one of their best displays under Taylor. But a touch of class by Dennis Bergkamp reduced the deficit and England would lose the injured Gascoigne thanks to Jan Wouters’ elbow. Taylor later fumed: “It was a premeditated assault, utterly disgraceful. And he didn’t even get a caution.” It wasn’t the last time Taylor would rue refereeing decisions during the qualifying process. But it looked like England would see the game out until five minutes from time. Des Walker had been immense for England at Italia ’90 but was now suffering a dramatic loss of form. England were frustrated when the Dutch visited Wembley. Walker panicked into pulling back Marc Overmars, the referee pointing to the spot with Peter van Vossen levelling as the game finished 2-2. The smart money would have been on a draw beforehand and England still stood a good chance of making it, but it was a crushing blow to have squandered victory. They had now been pegged back in home games against their main two rivals. “We played very well in both of those games and if we had won just one, which we deserved to, we would have been ok,” reflected Taylor 20 years later. Mathematically his statement wasn’t quite correct, but things may well have panned out differently had England seen out either of those games. The first serious doubts that England would make it came at the end of the season. During fixture negotiations England had been handed away trips to Poland and Norway within five days, in an era when double headers were rare. If England could take three points or more they would look favourites to make it to the USA, but a defeat in either clash would be worrying. The first match was a Saturday night trip to Poland, England showing their limitations as they trailed at half-time and almost fell further behind. They got out of jail with a first England goal for substitute Ian Wright to salvage a 1-1 draw. Ian Wright rescues England in Poland. If that had been disappointing, then what followed over the next fortnight would go a long way to sealing Taylor’s fate. England went into the away game against Norway having not lost a World Cup qualifier since their previous visit in 1981, but they produced a performance that sadly merited that run coming to an end. A decision to switch to three centre backs failed to help matters and England missed the combative presence of the suspended Ince, as the side slumped to a costly and deserved 2-0 defeat. For the first time England were in real trouble, while Norway moved closer to qualifying. They would duly top the group. Feeling low from the Norway defeat, England now headed off to the USA to compete in the US Cup against Brazil, Germany and the hosts. If the main aim of the trip was to help England prepare for the World Cup in America a year later then it was already looking a futile exercise. But they did get one piece of positive news while out there, with the Netherlands being held to a draw by Norway in a World Cup qualifier to keep England in with a shout. Any pleasure from that result quickly evaporated on the same evening as Taylor’s side sank to a 2-0 defeat to the USA. It provided more ammunition for Taylor’s critics, ‘Yanks 2, Planks 0’ the latest headline to scream out how badly things were going. Goalkeeper Chris Woods would be a fall-guy, never being capped again. To their credit, England picked themselves up and produced much-improved displays in drawing 1-1 with Brazil and narrowly losing 2-1 to Germany. But the damage had already been done and the Norway and USA defeats were what the summer would be remembered for. A run of six games without a win meant Taylor urgently needed a response from his side as they prepared for the final three qualifiers. The first was at home to Poland in September, as England at least beat another of the top four sides. The win was wrapped up inside an hour as Ferdinand, Pearce and Gascoigne scored in a 3-0 success. 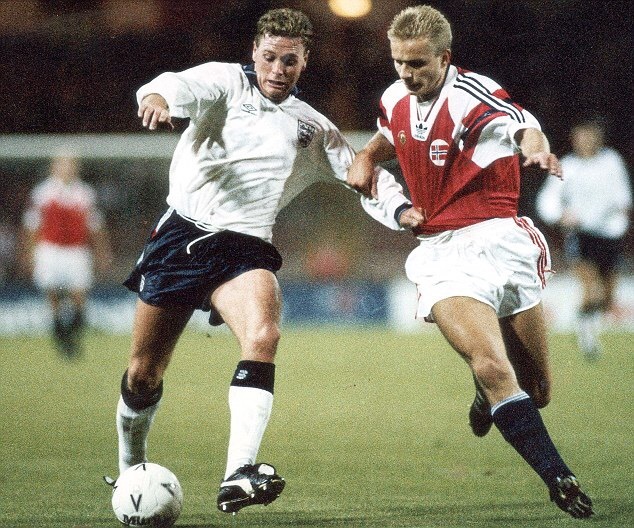 The one downside was Gascoigne picking up a caution to rule him out of the following month’s showdown in the Netherlands, while they would also be without Pearce. It wasn’t quite going to be winner takes all in Rotterdam, but to all intents and purposes it was. The sides were level on points so whoever won would need just a point from their last game (the Dutch away to Poland, England taking on San Marino in Bologna) to be sure of going through. If it was a draw then things would get complicated, England needing to beat San Marino by a sufficient score to take them through on goal difference (assuming the Dutch beat Poland). It was a scenario that would suit Taylor’s team. The build-up saw Taylor have an infamous exchange with journalist Rob Shepherd at the press conference, captured in the fly-on-the-wall documentary about the campaign that would soon make headlines (we will save assessing that show for another day). Given how much was at stake, if you look at it as a neutral for a minute then this was actually a bloody good game of football in which both sides went in search of the result they needed and created several decent chances. The Dutch were always a threat with wingers Marc Overmars and Bryan Roy continually a danger, while at the other end Tony Dorigo and Paul Merson both hit the post and Tony Adams had an effort cleared off the line. But controversy and key incidents were never far away, not all to England’s detriment given Frank Rijkaard’s goal was dubiously ruled out in the first half. During the second half the same player was somehow denied by David Seaman. Yet those moments would not live in the memory. Instead it would be the lasting sight of Ronald Koeman hauling back goalbound David Platt at 0-0. The referee initially appeared to award a penalty, eventually determining it was a free-kick on the edge of the box. But more contentious was the decision not to dismiss Koeman. “Is that not a sending off offence?” asked ITV co-commentator Ron Atkinson, rhetorically. Taylor was understandably livid on the touchline. Graham Taylor experiences a painful night in Rotterdam. As is well-known, Koeman duly scored a retaken free-kick with Taylor’s wounds deepened by England not having the chance to themselves retake a free-kick after being charged down in similar circumstances. Bergkamp wrapped up the 2-0 Dutch victory to effectively seal England and Taylor’s fate, as the manager told the linesman that his mate had cost him his job. “That blond man should not be on the field,” he said angrily when interviewed by ITV immediately afterwards. The man’s fury and pain was clear for the nation to see, knowing he would now face even more calls to leave. It was a low point, but – although criticism was pouring in over England’s impending absence from the World Cup – there wasn’t the same level of disappointment over England’s display as there had been in Norway. But the damage had been done. England needed the Dutch to lose in Poland and for them to beat San Marino by at least seven goals (assuming Poland only won by a one-goal margin). A big England victory was feasible, and it was possible that the Netherlands could could unstuck in Poland. But most were resigned to the inevitable, the Dutch good enough to get the result they needed against a side already out of the running. 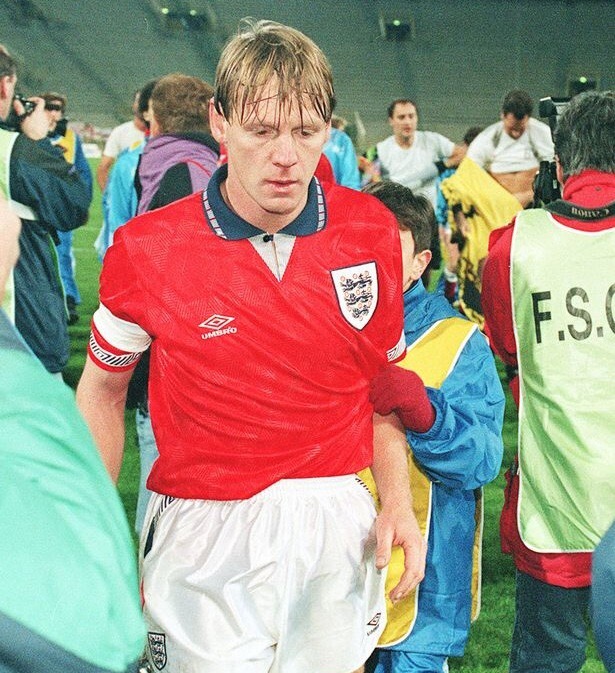 Captain Stuart Pearce leaves the field after England fail to qualify for the World Cup. Taylor’s departure was inevitable, but it would not be confirmed for almost a week. 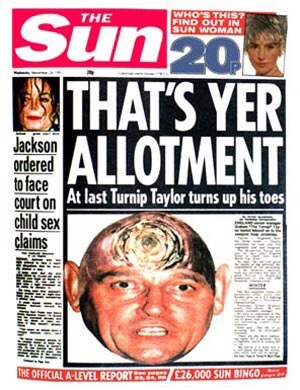 ‘That’s Yer Allotment’ proclaimed The Sun’s front page, again accompanied by a picture of his head as a turnip. The man had failed to take England to the finals, but the joke had gone too far. It was now getting extremely personal and generating an unnecessary level of hatred against a decent man. Taylor’s record in itself was not bad, but in three matches that had really mattered – against Sweden at Euro ’92 and then the World Cup qualifiers in Norway and the Netherlands – England had been beaten and that was sadly what many would remember his reign for. England would not be at the finals and for Taylor – so successful with Lincoln City, Watford and Aston Villa – it constituted his first real failure in football management. He had taken stick for his style of football before but now it was for his inability to get results. The flack he had taken – along with predecessor Bobby Robson – created the impression managing England was no longer seen as quite the dream job it once was, as the FA began looking for a successor. England Memories England’s qualifying campaigns: 1994 World Cup – did we not like that?